You are here: Home / destinations / Cabin Charter or Bareboat Charter? 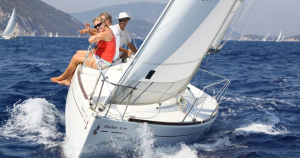 Enjoying a sailing holiday has become over the years more and more affordable, with many options and destinations all over the world to choose from. The low cost flights available from and to just about everywhere, enable traveller to reach even the farthest corner of the world making an holiday in natural paradise become an everyday reality just a few clicks away. 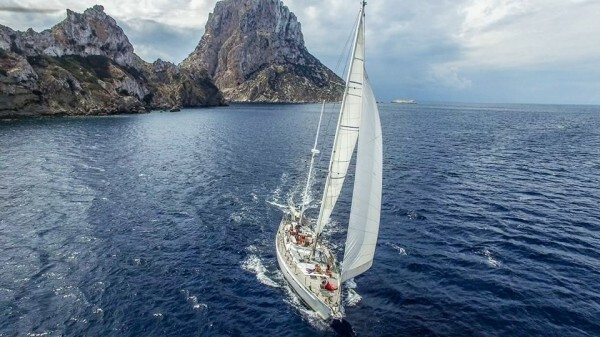 To rent a sailing boat, catamaran or motor yacht, one can contact a private owner, a travel agency in their own city or an online agency, in a world 2.0, where a good majority of the population has a smartphone the possibility to book the vacation of your dream with just a few clicks has become the preferred option. The plus points of online agencies are the wide range of choice between sailing destinations, type of boat on offer and the best choice of available deals all over the world and the many option of cruise type one can choose from: bareboat, crewed or the increasingly more popular cabin charter formula where it is possible to book just one cabin and not necessarily the entire yacht. Cabin charter cruises are growing fast globally in the boating sector and the changed global market is influencing the way sailing cruise are offered. People can literally be brought everywhere and go everywhere by plane, so that even if you are alone, just a couple or a small group enjoying a sailing vacation just about everywhere in the world has become an easy reality. Before it was only possible to rent a boat with a fix price and a fixed number of participants, all put together by the people renting the sailing boat or catamaran. Nowadays cabin charter cruise are new way to sail, this type of sailing vacation is more and more in demand not only because it can be a very frustrating mission to put together a group of friends or a large enough family, but also because it could be too expensive to pay the full price of a sailing tour when dividing the costs between just a few travelers or the same family. Cabin charter cruises allow for singles, couples, small families and groups of friends to meet other like minded travelers around the world who are joining the same cruise and pay a relatively smaller fee since the costs of the vacation are divided among all the participant. Often enough, it is also possible to enjoy a whole new level of luxury, like being on board avery big sailing boat with crew and cook to cater to your every need, since the costs of a single cabin are relatively lower than the cost of an entire boat. For people wanting or simply needing to rent a cabin charter the big question remains one: will there be any risk to find onboard the wrong person who will ruin my vacation? To answer this question, it was decided to ask a true expert in this sector: Captain Luca who has been the skipper of a 20mt long Kanter Ketch for more than 20 years and met a great number of guests each summer, especially in the last 6 years when he the boat he sailed was dedicated exclusively to cabin charter cruises. It has been his personal experience in all this years that all the people, ailing from all the corners of the world, who came on board for a week or more to enjoy a sailing vacation were all very motivated by the same feeling of wishing to enjoying the sea, the sun, the boat life and the opportunity to spend some good times with the other travelers onboard. The resulting atmosphere on board the sailing boat was always amazing, the guests were having lot of fun and enjoying chatting and getting to know each other in a easy way, especially during meals and for sure during the aperitif! Guests were always free to stay by themselves or be more active together and free to stay onboard or be brought to land for day excursion or evening dinner in the local restaurants, or just to explore the place for some evening fun. No need to move all together, since each guest is free to decide what to do of his or her day: be more social or go around alone? Enjoy a romantic dinner with their partner or a fun night out with some new friends made on board? Captain luca is sure after all this years that cabin charter travellers have more probability of having a good time together simply because even before starting the vacation they already know that they are going to share a boat vacation with strangers and come on board already psyched to have a good time and be respectful of the others on board, so as to minimize the possibility of clashing personalities on board. Quite differently in his experience private charters have more opportunity of creating strife on board than a group ofstrangers who come together for a relatively short time with the purpose of having a good vacation. Often a group of friends who have known each other for a long time have more risk of sparkling a conflict since questions like: where to eat tonight? what to do in the afternoon? which place do we visit first? do we stay here more or move on to the next stop? And many other simple choices may become harder to take if part of the group vote for one solution and the rest for a different decision. 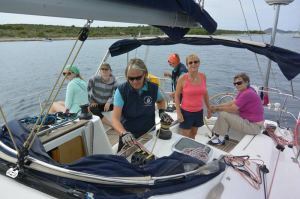 Of course this are questions that will come up also in a cabin charter cruise, but the big difference is that in this kind of sailing tours there is no big group that has to do the same thing, the guests can take their individual decisions: relatively speaking. The tour stops will all have been decided and discussed before and if there is a cook on board they will have already offered some choices about the menu, but no one will tell you that you will have to do that one thing just because all others are doing it too. Of course the size of the boat also matters, with a bigger boat there will be more opportunity to have privacy, or places to enjoy the sun “alone”, or even have meals at different tables or different times, since a bigger boat means generally more luxury and more opportunity to have a crew and simply more space to enjoy the holiday, since there are also travelers who are not very social, but enjoy just some pills of social moments and that’s totally fine too, since each person is different! Cabin charter are a relatively new kind of holiday experience, putting together people from all over the world, creating new friendships, new holiday destinations and activities. Creating perhaps also new job opportunities for sea lovers, on both sides of the spectrum: those who have a boat to rent and those who want to make finding the perfect sailing holiday an easy and fun experience.